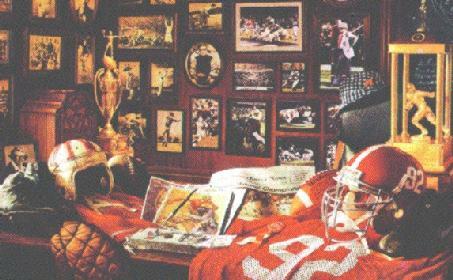 These are my favorite sports pictures of all time! 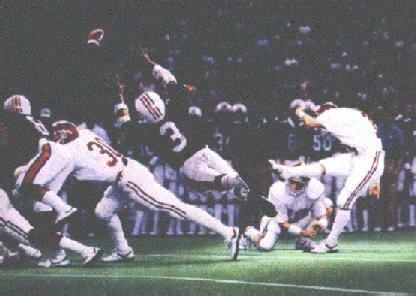 Van Tiffin's 53 yard field goal against Auburn in the 1985 Iron Bowl Classic is my favorite moment in Alabama football history. With 3 seconds left on the clock, Van kicked a 53 yard field goal to beat the Tigers. Incidentally, #3 for Auburn was offsides on the play, and if he had missed the field goal he would have had another attempt at it from 47 yards. 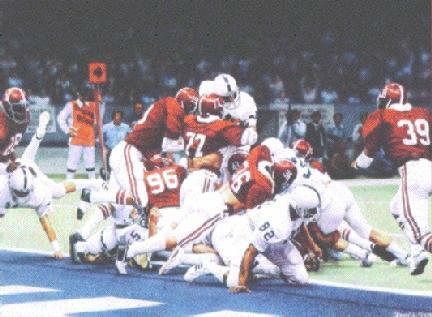 Alabama vs. Penn State in the 1979 National Championship game. On this 4th down play, Alabama stuffed the Penn State runningback to preserve a 14-7 victory and the National Championship. Interestingly enough, the yard marker in the background is indicating that it was Alabama's ball. Nobody knows why the official was holding it the wrong way! 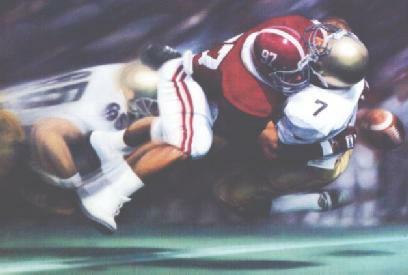 Cornelius Bennett knocking Notre Dame quarterback Steve Buerlein out of the 1986 game. 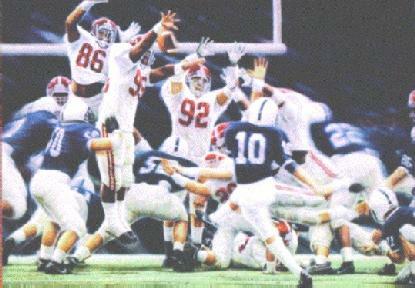 The "Desperation Block" preserved an Alabama victory over Penn State at Beaver Stadium in 1989.